UPDATED: Mon., Sept. 26, 2011, 12:46 p.m.
Fire investigators at daybreak began going through the remains of two historic Garland District restaurants – one a Depression-era icon and the other a popular diner featured in several Hollywood films – that were heavily damaged Sunday night by fire. 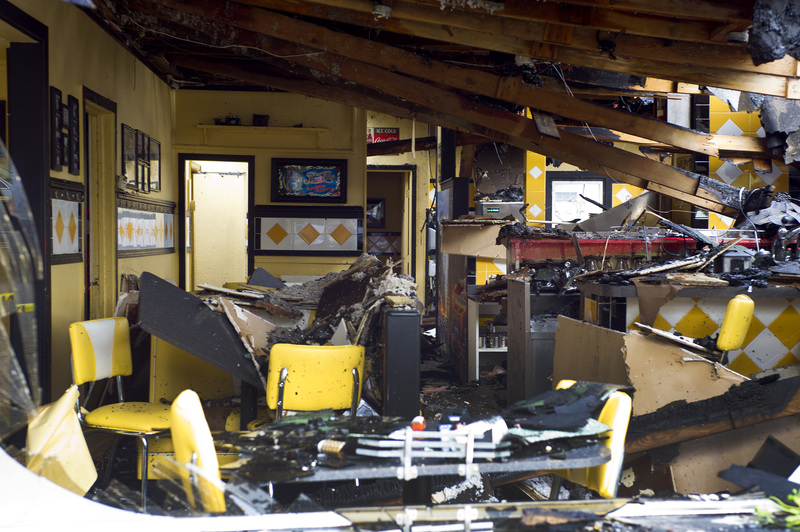 Ferguson’s Café was completely destroyed, Spokane fire investigators said today. Mary Lou’s Milk Bottle restaurant “has many levels of damage and is still being assessed for structural integrity,” according to a statement from fire officials. Total damages are expected to exceed $1 million, officials said. The cause remains under investigation today, but fire officials say the blaze appears to have started among cardboard, plastics and other “ordinary combustibles” piled in a walkway between the Milk Bottle and Ferguson’s. The fire reached a natural gas meter, which intensified its growth, officials said. Firefighters initially tried battling the three-alarm blaze inside the Milk Bottle, 802 W. Garland Ave., at 8:42 p.m., but they had to pull back as heavy flames spread around them and over to Ferguson’s next door, authorities said. Both structures were heavily damaged, and investigators said it was questionable whether either one of them could be restored. Damage to the roofs of both eateries was severe, officials said. During the fire, crews used protective foam in an effort to keep the flames contained. “Our concern was stopping it from spreading down the whole block,” Spokane Fire Chief Bobby Williams said. The orange glow of rolling flames was visible from several blocks away, drawing more than 100 people to the scene to watch the firefighters work, with many snapping pictures. Authorities were alerted to the fire at 8:42 p.m. It took two hours to bring the fire under control. Ferguson’s Cafe owner Dave Jones stood near the fire command post Sunday night watching intently as passers-by offered their condolences. He appeared devastated. The owners of Mary Lou’s Milk Bottle had left town Sunday. But their son, Dan Ritchie, hurried to the scene after being advised of the fire and was standing by as firefighters sought to keep the blaze from spreading. The restaurant, with its iconic milk bottle shape, is one of Spokane’s most recognizable commercial district landmarks. Williams said the cause of the fire remained under investigation, adding that there was a report of an earlier explosion but no confirmation. Witnesses also said they saw a downed power line arcing between the buildings. Ferguson’s Cafe, which closed in 2009 but was later reopened, was featured in three movies, “Vision Quest,” “Benny & Joon” and “Why Would I Lie?” Ferguson’s first opened in the 1930s. No injuries were reported. Fifty firefighters responded in 13 fire rigs. This story updates an earlier version that appeared in this morning’s newspaper and overnight on the online version of The Spokesman-Review. Published: Sept. 26, 2011, 7:56 a.m. Updated: Sept. 26, 2011, 12:46 p.m.